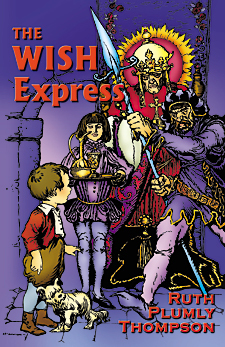 "Marvelous Travels on a Wish, Part 1"
Author of The Gnome King of Oz, "The Wizard of Pumperdink", "King, King! Double King! ", etc. Originally published in the Philadelphia Public Ledger, July 9 and 16, 1916. "Goes five times and three to carry," muttered Berens, chewing his pencil gloomily. "Jinks! That can't be right 'cause there couldn't be a third of a man left!" For a few minutes the pencil squeaked busily - then bang! flew the lesson book into the corner so suddenly that Rags, the Skye terrier, woke with a jump. "What good are divisions?" scowled Berens, thrusting his hands deep into his pockets. "I don't believe other little boys have as many lessons as I have," continued Berens crossly, drumming his fingers on the window pane. "Anyhow, home is a poky old place. I wish, I just wish I was SOMEWHERE ELSE and SOME ONE ELSE - I just - Oh! Oh! Ouch!" Something had bitten him sharply. "Ki-yi-i!" yelped Rags in the same breath. The next minute Berens was jerked into the air out of the window, up over all the chimneys and housetops. Whi-z! Whi-r! he went spinning through the sky. He tried to think, but his head might just as well have been a huckleberry pudding for all the good it was to him, only 'twas full of multiplication and division signs 'stead of huckleberries. "Oh, where, where am I going?" he gasped in dismay as he went dipping and ducking through the clouds. "Most extrawdinree! Most extrawdinree!" exclaimed a sharp voice from somewhere just above. "But it all comes of division - I always knew no good would ever come of division. Now, why can't those stupid two-legs be satisfied with whole things? But no, they are forever dividing their apples and pies and pencils - catch me dividing my bones and biscuits!" There was something familiar about this voice and Berens, brushing aside a cloud that had settled stuffily upon his head, peered up and caught sight of Rags sprawling though the air a few feet above him. "Of course," Rags was saying now in a grieved voice, "being a Skye terrier I might have expected to find myself skied sooner or later and perhaps I shall get used to it in time, but I shouldn't wonder if it would take a dog age!" For a few moments the two whizzed on in silence, Berens too surprised to speak. He had always thought Rags could talk if he wanted to, but it really took one a little while to get used to the idea of it. "Wonder what one eats in these parts?" continued Rags at last in a depressed voice. "Gives me the sky-blues to think of it!" "Maybe there are sky-bones," called Berens hopefully, emerging from a gray cloud and careening along beside Rags. "What! You here?" cried Rags delightedly. "Well, thank my dog star for that!" They surely looked comical, sweethearts, as they blew along - Rags with his legs set stiffly, his ears plastered tightly back against his head, while his hair puffed out for all the world like the petals of a huge chrysanthemum. Berens spraddled along after him like an ungainly bird. "But what shall we do?" asked Berens breathlessly. "Do" Jerked Rags dubiously. "Well, my mother always said, 'When in doubt wag your tail,' but I don't see how we can wag our tails with the wind blowing at this rate." "Nonsense!" began Berens crossly, when down almost upon their heads whirled a gigantic bug - oh, a frightful, fearful - oh, a terrible bug! It had 19 arms and 17 legs. Its 19 arms ended in 19 yellow serviceable cotton gloves and its 17 legs in 17 common-sense shoes, which was extremely fortunate, for otherwise there would have been no distinguishing between its arms and legs. Jauntily upon its head perched a motorman's cap. With its twelfth cotton glove it seized Rags by the ear and with its sixteenth it grasped Berens by the hair (which was very unpleasant). "Come on!" cried the bug, and working the rest of its arms and legs like ferryboat paddles, progressed through the air at a terrific speed. There was not much for Berens and Rags to do under the circumstances except come, and it was mighty scaresome coming at that. "My eyelashes! My eyelashes!" wheezed the bug irritably, "we shall miss the WISH!" "Miss the which?" snapped Rags, trying to squirm 'round and get a better view of the strange creature. "Did you say witch?" gasped Berens in alarm. "The question is which," croaked the bug disagreeably. "Wish or witch? As it happens, young man, I said WISH, wish, wish, WISH!" "Oh, dear," groaned Berens in a low tone to Rags, "it's pulling my hair frightfully and I never heard of missing a wish and isn't it disagreeable?" "My ear, on, my ear!" moaned Rags in concert. "I shall be hard of hearing after this, I know!" Faster and faster whirred the three through the sky. At last, Berens ventured a polite question. "Please, sir," said he breathlessly, "where are we?" "Up in the air," replied the bug shortly. After a long pause it continued. "You made a wish, didn't you? Well, a wish always goes up, doesn't it - couldn't possibly go down, you know - and people who make wishes are bound to go up in the air sooner or later and here you are. That's all! But what's the use of making a wish and then missing it? Besides, you brought me all the way from Europe where I was most exceedingly occupied," he grumbled crossly. "Would you mind very much telling us your name?" shouted Berens, for the wind was blowing so hard that otherwise he would not have been heard. Dissatisfied Bug - three groans for me!" "I bit you," he added jocularly. "Was that YOU?" cried Berens, remembering the sharp bite he had received just before being jerked into the air. "Oh!" groaned Rags, "you bit me, too!" The bug paid no attention to this. "Hello!" it exclaimed suddenly. "There she is!" and plunged at top speed into a purple cloud. Berens and Rags sneezed violently, for the cloud was wet and clammy. When they had come through it and Berens had left off sneezing he saw a trolley car (or, at least, it looked like a trolley car) gliding swiftly along just ahead. With a mighty stretching of its arms and legs the bug caught up with the car and sprang upon the step. "Don't crowd! Step lively! Get aboard there!" shouted the Dissatisfied Bug, dumping the two unceremoniously in through one of the windows and climbing itself upon the front platform. Skyrockets! Skyrockets!" shrilled an excited voice. "An outrage!" grumbled a deep bass. "Get off my trunk, won't you?" "Mind what you're about!" chimed in a score of other voices all together. Berens opened his eyes dizzily, for he was being pushed and prodded in a scandalous fashion. He and Rags had fallen upon the floor of the car, pshaw, I mean WISH, and were surrounded by the strangest company he had ever seen in his life. There was an elephant feebly waving his trunk, a farmer's boy with a rake, a tired-looking horse, a little old lady in a black poke, a persimmony old gentleman in a high hat, a serious-looking donkey, a little red-headed girl, a serving maid with bobbing bonnet strings and last of all a tall, thin young man with a ferocious mop of hair. They were all pushing and jostling each other in an effort to get a better view of Berens and Rags. "It's a skyrocket, I tell you!" shrilled the little old lady in the black poke, prodding Rags sharply with her cotton umbrella. "Stop that!" snapped Rags, showing his teeth. "He's not!" cried Berens indignantly. "He's a Skye terrier!" "Sky terror?" said the little old lady, who was a bit deaf. "SKYE TERRIER!" shouted Berens angrily. "Hey?" said the little old lady, "sky terror. Course he's a sky terror, and that's as bad as a skyrocket - one and the same thing - sky terror and skyrocket. I - " brandishing her umbrella. "Sit down!" said the donkey, pushing her violently into her seat so that her black bonnet fell forward and completely snuffed her out like a candle. "Skyrocket! Skyrocket!" still came in muffled tones from under the bonnet. "Now!" drawled the donkey, pushing his way to the front, "everybody sit down." The donkey seemed to be a person of some authority, for the passengers, muttering "Outrage!" and "Imposition!" and a good bit more, that I haven't time to tell you, went grumbling back to their seats. "You see," said the donkey, waving its foot apologetically, "this wish is full, so you'll just have to get off and take the next one." "Couldn't they move up a bit?" said Berens anxiously, "there's plenty of room." "Nothing could move me!" announced the elephant, and spreading comfortably over at least six seats he promptly fell asleep, snoring loudly. "Get off! Get off!" shouted some of the others crossly. Rags looked sadly at Berens and, scratching his ear, remarked in a low tone, "I think I begin to see the use of division. Now, if each of them would just give us a small piece of his seat we might between us have a whole one." Berens was getting mad. "Well, of all the pigs!" he began angrily, but here the little red-headed girl, who had been prodding the thin young man next to her unmercifully, beckoned to him. "Come on over here!" she called cordially. So Berens picked up Rags and squeezed in between the two with a sigh of relief. At this most of the passengers stopped staring at them and either went to sleep or retired behind their papers. "This wish is just like a trolley car," thought Berens to himself, and leaning curiously around the thin man he was surprised to see that the Dissatisfied Bug was the motorman. It used its arms and legs interchangeably and the serviceable cotton gloves and common-sense shoes whirled round the wheels and brakes in a dizzying fashion. "Here comes N.," said the little red-headed girl, touching Berens upon the arm. "Who's N.?" asked Berens, without turning round, for the Dissatisfied Bug was at this minute holding its cap with its sixteenth yellow glove, taking out its handkerchief with its second, counting its change with its eleventh and twelfth, twirling its whiskers with its tenth, combing its hair with its first, while with the rest of its arms and legs it ran the wish. "My!" said Berens admiringly, "that's something like! Now, if I just had that many arms and legs, I'd - "
"Fares, please!" roared a terrible voice. Berens turned round with a jerk and saw the most curious creature you can imagine swinging down the center of the wish. Rags' hair began to bristle with fright, while Berens shook so that he nearly fell off the wish. No wonder! It was a terrible-looking monster - bright green for one thing. At first Berens thought it must be a dragon, because it was covered with scales. "Don't mind him," said the little red-headed girl, "it's only N., you know." All the time the green-eyed monster was drawing nearer. Berens glanced anxiously around the wish to see what the other passengers were doing. They did not seem to be the least bit frightened; "and if they're not frightened I needn't be," reasoned Berens to himself. So trying to appear very much at his ease, he turned to the little girl and asked in a voice that would shake a little in spite of all he could do, "Did you say it was N.?" "Uh huh!" answered the little girl, kicking her heels unconcernedly. But here a great excitement arose. "Well of all the - "
Berens stared around in amazement, for each passenger as N. V. demanded his fare reached over and grabbed something from his neighbor to pay it with. The farmer's boy plucked out the persimmony old gentleman's scarfpin; the little old lady tore out a whole handful of the thin young man's hair and handed it to the green-eyed monster; the elephant rose up ponderously and pulled a bit off the donkey's hide, at which the donkey brayed furiously and bit off a length of the elephant's tail; the serving maid seized the little red-headed girl's necklace; the horse put his hoof through the old lady's poke bonnet and gravely held it out to N. V., and they all made such a terrible to-do about their fare paying that Berens covered his ears, while Rags stuffed his head beneath Berens' coat. At this minute the long-haired young man put out his long arm and snatched Berens' red silk necktie, while some one from across the wish ripped off Rags' collar. "Stop!" cried Berens in a fury. "I'll tell my father - " but here the little red-headed girl calmly took his watch and handed it to the monster, his very best new-at-Christmas watch! At this Berens started to jump out of his seat, but now he himself was confronted by the green-eyed monster. It flapped its fins impatiently and droned, "Fare! Fare!" "You'd better pay," said the little girl warningly, "or he'll put you off." So Berens, swallowing his rage as best he could and with a secret satisfaction, leaned over and violently jerked out the thin young man's silk handkerchief, while Rags, not to be outdone, jumped down and bit a huge piece from the young man's frayed trousers. N. V. greedily took the two fares and then stuffing all of the strange collection in his conductor's cap (which he had been holding all this time in his tail), he clapped it upon his head. The poke bonnet protruded all round, the red necktie hung down in his eye, while the bunch of hair kept tickling his ear; but not seeming to notice these slight inconveniences, he bawled in a loud voice: "This WISH is bound for Somewhere Else! First stop Talktown! All aboard! Are we all aboard?" blaring angrily around the wish. "Sure!" said the horse, who was somewhat of a wag; "bored to death!" "What a strange conductor!" thought Berens as the green-eyed monster clattered down the wish, closing the door with a bang as he stepped out upon the platform. The wish was traveling very fast now, but Berens was so interested in his fellow-passengers that he hardly once glanced out of the window, which is a pity, for a wish carries one through strange countries, I can tell you. Rags, worn out with his flight through the clouds, had fallen asleep in Berens' lap. "N. V.," mused Berens aloud, "now, what can that stand for," and here began running over in his head all the things that began with N. and V.
"Not very much, if you'll pardon my saying so," said the horse, who sat directly opposite. He had been looking at Berens for some time, and now he nodded his head sociably. "Well, he's the very queerest conductor I ever saw," said Berens, glad to have started a conversation. "He's really not a conductor, you know," went on the horse slowly, crossing his legs. "He's what you might call a nonconductor, a nonconductor of kindness." After saying this the horse turned his head self-consciously from side to side to see how the others were taking it; but they nearly all were asleep, so it passed unnoticed. "They're a fine lot!" he snorted contemptuously, and with a gusty sigh he turned and gazed out of the window. Berens, seeing that nothing more was to be got out of him, turned to the little red-headed girl. "What's your name?" he asked. "Sarah Ann!" said the little red-headed girl bitterly; "but when I'm Somewhere Else my name's going to be Florabell Elizabeth, and I'm not going to have a single freckle, so there!" she finished triumphantly. "You have got a good many," said Berens, eyeing her speculatively. "Ever count 'em?" "Well, I did start to once, but I lost count," replied Sarah Ann in a depressed voice. "Would you like me to try?" asked Berens obligingly. "It's no use," sighed Sarah Ann gloomily. For a few minutes nothing more was said, then, "You've 29 on your nose," said Berens in an interested tone. "Thirty-two," corrected Sarah Ann listlessly, "but do talk of something else." "Can you pitch a curve?" asked Berens after some thought. "Sure!" said Sarah Ann, kicking her heels, "and I can skin the cat, walk the fence with clothes-props and lick every boy in our block," she finished challengingly. And the prize will be a fly. In a manner very neat. She tried to run and hide 'er. uh, self, you know," finished the poet apologetically. First - "Liberty and union, now and forever, one and inseparable!" Second - "I have not yet begun to fight!" Third - "Millions for defense, but not one cent for tribute!" Fourth - "I only regret that I have but one life to give for my country!" Fifth - "Don't give up the ship!"